Maplestory M launched worldwide earlier this week. If you’re expecting the same experience of the original Maplestory, you’re in for a surprise. The original Maplestory, which launched in 2003, is a free-to-play 2D side-scrolling MMORPG where you can choose from a number of exciting job classes and explore hundreds of different worlds within the Maple Universe. In Maplestory M, you only have access to the original set of classes, The Explorers. You can still play and communicate in real-time with thousands of players from around the world. You can create and join guilds, and explore the endless customization options available like in the original game. However, Maplestory M takes the features that the original Maplestory offers and puts a “smartphone-friendly” spin on them for the better. Maplestory M does a great job of transferring the game’s original interface onto a phone, making it more user-friendly and without detracting from the gameplay. In the phone game, players can easily see and access their controls, menu, quests, chatroom, and health and magic bars at any time, whether they’re in or out of battle. In comparison, the original game, like most MMORPGs, has a large number of hotkeys attached to the game’s many features that can be difficult to keep up with as a new player. The easy accessibility and visibility of the game’s features is an improvement. Two game-changing features Maplestory M introduces are Auto Quest and Auto Battle. Auto Quest is accessible as soon as you start playing. It allows players to send their characters off to either obtain quests by engaging with non-player characters or fulfill the quest’s requirements, which may include killing a certain number of golems or obtaining a particular mob drop. Auto Quest is great because it lets you be lazy. Why fiddle with the area map in order to figure out where a certain NPC is, or waste your precious time searching for a specific mob when you can just automatically go where you need to go? Auto Quest decreases the amount of time you’ll need to dedicate to fulfill Maplestory’s often tedious quests, many of them which require going back and forth between NPCs to relay messages, so you can have more fun hanging out with your guild or exploring. Auto Battle unlocks when your character reaches level 20. Each day, you receive a free “2-Hour Charge” for Auto Battle, a feature that allows a player’s character to automatically attack and kill whatever mobs are on the map it is on. When Auto Battle is turned on, your character will automatically navigate around the map, attacking mobs, obtaining experience points, and absorbing resources in order to maintain your health and magic points. Characters aren’t immune to death or damage during Auto Battle, so if they run out of potions or are too weak for the mobs they are facing, they will die. Once Auto Battle runs out, you’ll have to resort to either actively grinding or handing over money to exchange for crystals, the game’s in-game currency, in order to lengthen your Auto Battle. It’s ideal for players who want to level up their character without having to put an active time investment into grinding. My favorite aspect of these two new features is that let you multitask. Auto Quest and Auto Battle continue to run in the background while you mess around with other applications on your phone or do other things in Maplestory M. This wasn’t possible in the original game. If you wanted to level up your character, you needed to sit down and grind. If you wanted to purchase things for your character, re-organize your character’s inventory, or sift through the possible accessories you can purchase for your character in the Cash Shop, you’d have to set aside time for that. Now, your character can grind and complete quests without you sacrificing your time and energy that you’d rather put into more worthwhile moments that the game offers, such as interacting with your guild and working together with others in the Elite Dungeon. 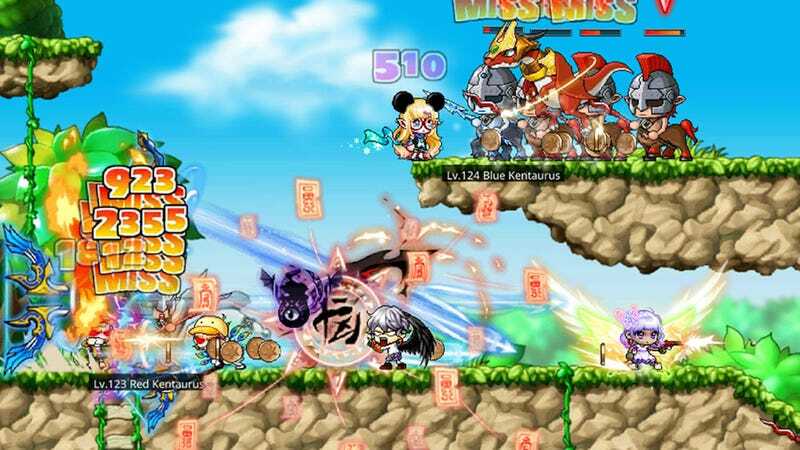 Maplestory M brought Maplestory back to life in a way that I didn’t expect it would. With the introduction of the Auto Quest and Auto Battle features, active time commitment is no longer a major requirement in order to enjoy the game. Whether you have been playing Maplestory since 2003 or are only just hearing about the game, you may enjoy what Maplestory M has in store for all of its players.